I was vaguely familiar with this hymn when I was younger. The weight of it hit me full force, however, when, as a 30 year old prodigal, I finally found peace with Jesus through discovery of His grace. The version of the song that woke me up was from the Jars of Clay album “Redemption Songs.” I’ve heard it done by a few others since then (e.g. Rebecca St. James, Jeremy Camp), but, not done nearly as effectively in my opinion. (1) When peace, like a river, attendeth my way,When sorrows like sea billows roll-Whatever my lot, Thou hast taught me to say,It is well, it is well with my soul. CHORUS: It is well with my soul,it is well, it is well with my soul. (2) My sin- O the joy of this glorious thought-My sin, not in part, but the whole,Is nailed to the cross, and I bear it no more:Praise the Lord, praise the Lord, O my soul! (3) And, Lord, haste the day when my faith shall be sight,The clouds be rolled back as a scroll:The trump shall resound and the Lord shall descend,”Even so”- it is well with my soul. This entry was posted in abba, christianity, cross, grace, hymns, life, love, redemption, religion, salvation, savior, self, sin, Uncategorized, when bad things happen to good people. Bookmark the permalink. What A wonderful hymn. It is one of my favorites! I thank Him daily for simply loving me. Because of this love, His blood was shed for our redemption…the forgiveness of our sins. Forgiveness costs us nothing. All our costly obedience is the fruit, not the root, of being forgiven. That is grace. But it cost Him, His life. That is why we call it just! Oh, Amazing Grace,how sweet the sound, that saved a wretch like me… it is well with my soul! I love music and recognize it to be an important tool of humanity—both for good and for evil. 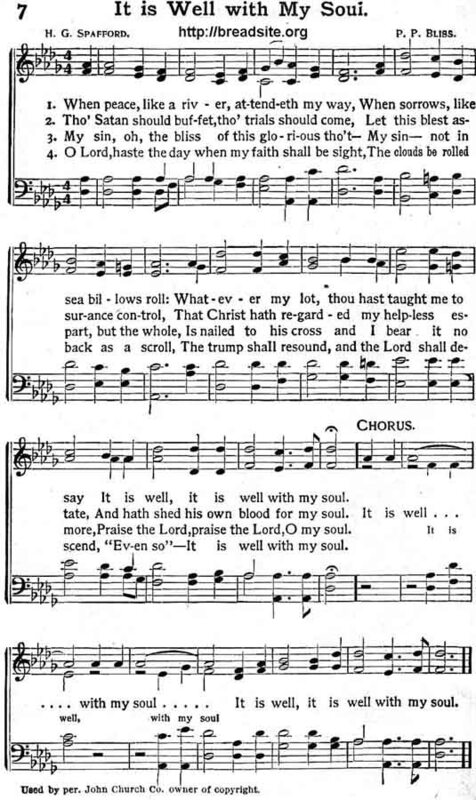 Some of the new praise and worship choruses are beautiful, but, to me (maybe it’s because I am of an older age), there is nothing quite like the old hymns. Thanks for bringing this one again to my attention.